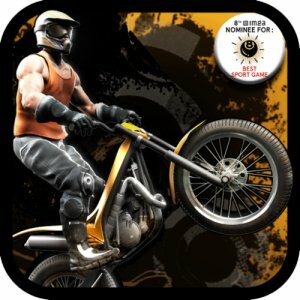 Satisfy your inner-adrenaline junkie by bringing some extreme dirt biking to your Android device. Live vicariously through Trial Xtreme 2 with an ultra-realistic rider and incredibly accurate bike physics. Trial Xtreme 2 is the sequel to the hit Trial Xtreme, packed with with more levels, amazing new graphics, and more blistering motorcycle stunt action than ever. Crank up the throttle, rev your engine, and negotiate your way across 36 new action-packed levels. Trial Xtreme 2 uses the cutting edge NVIDIA PhysX engine which provides icredibly realistic physics-based action and an intuitive tilt-control system using your phone's accelerometer. You'll have the most realistic ride of your life, demanding skill and concentration to take your bike riding skills to the max. This is an unforgiving environment for rookies. See if you've got the skills to master the rough tracks. Use the responsive tilt-based controls to navigate your bike across ramps, exploding barrels, jumbo tires, and other obstacles. Unless you want to eat dirt, it's all about balance, skill, and control. These stunts may be ill-advised, but aren't they fun? Incredible graphics bring your rider and game to real life. The ultra-realistic physics actually allows you to feel everything as you flip, jump, bump, and crash your way through the obstacles. Share your dare-devilish tomfoolery with your friends. Max out your score and compete against the world through OpenFeint.